Osteoporotic fractures have become a major source of mortality and morbidity in older people due to the progressive aging of the population.1 In most developing countries, osteoporosis (OP) has rapidly become a critical health problem as it is related to age and costs. Although OP has become a major threat to aging women in terms of morbidity and mortality, it has not been widely recognized as a significant health issue in aging male population. The majority of elderly men who have a previous fragility fracture are not aware of undergoing bone mineral density (BMD) screening tests or receiving medical treatment.2,3 OP in men is largely neglected in People’s Republic of China. Prediction of the risk of developing OP in elderly males is important to prevent the occurrence of first fracture. BMD measurement by dual-energy X-ray absorptiometry (DXA) is the current gold standard for diagnosing OP. According to the World Health Organization (WHO), OP is defined as a BMD value of <2.5 SD below the mean value at any site of the lumbar spine (L1–L4), femoral neck, or total hip.6 Currently, there is no uniform standard for diagnosis of OP in men; however, a previous study has found that BMD at the lumbar spine site declines with age in women, but it is not applicable to men.7 Therefore, some scholars hold the opinion that the femoral neck can reflect the BMD of men more precisely. Although BMD measurement is expensive and invasive, some guidelines recommend that men at high risk of OP (aged ≥70 years or men aged 50–69 years with risk factors) are supposed to undergo BMD test by central DXA.8 Owing to the huge population of People’s Republic of China, there would be a large financial burden caused by OP. Hence, it is necessary to obtain a better way to predict OP in People’s Republic of China. Various OP screening tools have been developed by multiple organizations, such as the Fracture Risk Assessment Tool (FRAX), Osteoporosis Self-assessment Tool for Asians (OSTA), and weight-based criterion. Body mass index (BMI) has been used to assess obesity and health in individuals with an international standard. Some studies show that BMI is related to osteoporotic fracture risk. The results of previous study suggest that women aged <60 years with low BMI (<20 kg/m2) should go for a DXA.17 Overall, many studies show that BMI and BMD have a certain correlation in postmenopausal women.18 However, whether BMI can be a very-effective tool for predicting OP in elderly male population remains to be confirmed. Hence, the goal of this study is to compare the validation of FRAX without BMD, OSTA, and BMI in predicting primary OP and to find suitable thresholds to omit BMD testing reasonably in a community-dwelling elderly male population in Beijing. The study was approved by the ethics committee of Beijing Friendship Hospital, Capital Medical University. All subjects provided signed informed consent to participate in this study. The flow diagram of the study is shown in Figure 1. Figure 1 The flow diagram of the study. Abbreviations: BMD, bone mineral density; BMI, body mass index; FRAX, Fracture Risk Assessment Tool; OSTA, Osteoporosis Self-Assessment Tool for Asians. It is a cross-sectional study and the study population included Chinese men aged ≥50 years consecutively recruited from three community health service centers (Fangzhuang, Tuanjiehu, and Wangzuo) from January 2014 to October 2015. 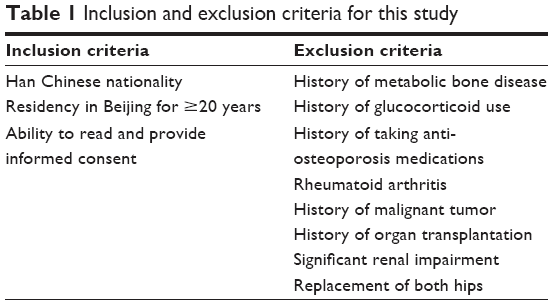 The main inclusion and exclusion criteria are listed in Table 1. The subjects had never been diagnosed with OP before. All the subjects were selected by stratified random sampling according to age proportion collected from three different communities. Each participant was required to complete a questionnaire including personal information and clinical risk factors for OP such as age, weight, BMI, previous fracture, current smoking, alcoholic drinks per day, parent fractured hip history, and so on. Weight was measured using an electronic balance (Tanita, Tokyo, Japan), and height was measured with a stadiometer (Mahr GmbH, Gottingen, Germany). The database established was checked by two researchers (XiaoDong Zhang and JiSheng Lin) to ensure the quality of data and control the total amount of data input per day and then checked by the senior researcher (Yong Yang). DXA (Discovery Wi, QDR Series; Hologic, Waltham, MA, USA) was used to measure the BMD of the femur (the femoral neck and total hip) and lumbar spine (L1–L4). To standardize measurements, all DXA measurements were conducted by a well-trained and qualified technician. The weight, height and BMD were measured with the same equipment throughout the study. The DXA machine was calibrated by the same technician every day by using the lumbar module. Osteoporosis was defined as a T-score (lumbar spine, femoral neck, total hip, and worst hip [femoral neck and total hip], the WHO [any site]) of −2.5 SD or lower. The decimal digits of the calculation results were then disregarded. For example, a 70-year-old man weighing 54 kg would have an OSTA index of −3. 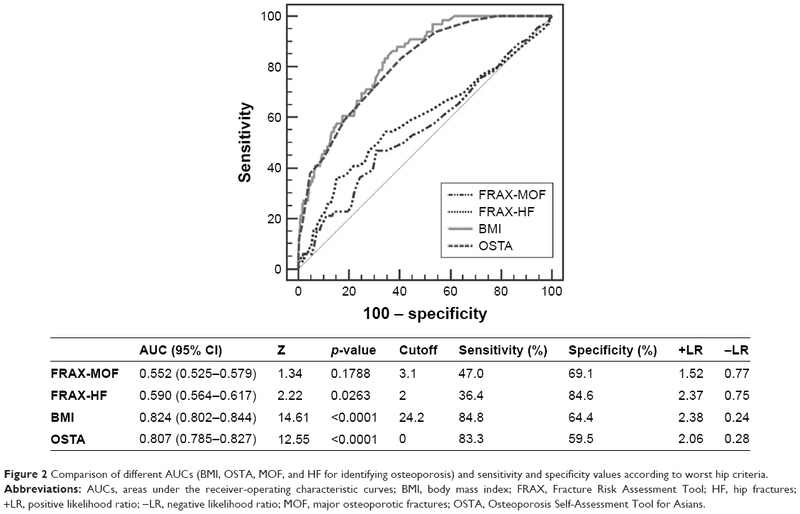 FRAX was a screening tool suggested by Kanis to predict 10-year probability of MOF and HF according to individual’s clinical risk factor information with or without BMD measurement.19 Because this study mainly focused on the ability of the FRAX tool to identify primary OP in men, the data were obtained without the BMD measurement. The performance of tests (FRAX without BMD, OSTA, and BMI) for predicting OP at the lumber spine, total hip, femoral neck, worst hip (femoral neck and total hip), and at any site was compared. The receiver operating characteristic (ROC) curve was constructed, and the area under the ROC curve (AUC) and its 95% confidence interval (CI) were estimated using SPSS Version 17.0 (SPSS Inc., Chicago, IL, USA) and MedCalc version 11.5.0.0 (MedCalc Software, Ostend, Belgium). The predictive value of the three tools was determined according to the AUC as follows: perfectly predictive, AUC =1; highly predictive, 0.9≤ AUC <1; moderately predictive, 0.7≤ AUC <0.9; less predictive, 0.5≤ AUC <0.7; and non-predictive, AUC <0.5.20 The independent-samples t-test and one-way analysis of variance were used for single-factor analysis. The initial data were recorded in a Microsoft Excel spreadsheet, and the analysis was performed using SPSS Version 21 (IBM Corporation, Armonk, NY, USA) software. A p-value of <0.05 was considered statistically significant. We identified the optimal thresholds with the results of AUC to maximize the diagnostic benefit and obtain the optimal OP missed value. Then, sensitivity, specificity, positive, and negative predictive values for each threshold were calculated and transformed into number of BMD measurements saved per 100 individuals (who would be candidates for screening) and the percentage of individuals with OP who would be missed. A total of 1,552 men aged 50 years or older completed the questionnaires and their BMD was measured; of whom, 1,349 individuals were selected according to the inclusion and exclusion criteria. The characteristics of the participants are shown in Table 2. Notes: aBone mineral density T-scores classified according to World Health Organization criteria: osteoporosis (≤−2.5), osteopenia (−1.0 to −2.5), and normal (≥−1.0). bTaking 30 g or more of alcohol daily (equivalent to three units of alcohol in the present study). cFractures after the age of 45 years. dWhether the patient’s mother or father had a history of hip fracture; subjects answered either yes or no. eWHO criteria, diagnosis of OP was determined by a BMD T-score of ≤−2.5 SD at any site of L1–L4, femoral neck, or total hip sites. Abbreviations: BMD, bone mineral density; OP, osteoporosis. The prevalence rates of OP according to the WHO, lumbar spine, worst hip, femoral neck, and total hip criteria were 12.8%, 10.8%, 4.4%, 4.9%, and 1.8%, respectively. The results showed that the relationship between age and OP was significantly different (p<0.05) among total hip, femoral neck, and worst hip criteria, but there were no significant differences (p>0.05) between the lumbar spine and the WHO criteria. A summary of the cutoff values and AUCs is listed in Table 3. The ROC curves for each tool were analyzed and various thresholds were assessed. AUC values of each diagnostic criteria are listed in Table 3. The AUC values of these tools for identifying OP ranged from 0.536 to 0.583 (MOF), 0.558 to 0.630 (HF), 0.722 to 0.874 (OSTA), and 0.801 to 0.880 (BMI). According to the total hip diagnostic criteria, OSTA and BMI obtained the highest AUC values (0.874 and 0.880) in this study. The results of the ROC curve and AUCs according to the worst hip criteria are described in Figure 2. Overall, predicting performance of BMI and OSTA was better than MOF and HF (FRAX without BMD), and BMI yielded the best predicted value. Abbreviations: AUC, area under the receiver operating characteristic curves; BMI, body mass index; OSTA, Osteoporosis Self-Assessment Tool for Asians; FRAX, Fracture Risk Assessment Tool; MOF, major osteoporotic fractures; HF, hip fractures; WHO, World Health Organization. Figure 2 Comparison of different AUCs (BMI, OSTA, MOF, and HF for identifying osteoporosis) and sensitivity and specificity values according to worst hip criteria. Abbreviations: AUCs, areas under the receiver-operating characteristic curves; BMI, body mass index; FRAX, Fracture Risk Assessment Tool; HF, hip fractures; +LR, positive likelihood ratio; −LR, negative likelihood ratio; MOF, major osteoporotic fractures; OSTA, Osteoporosis Self-Assessment Tool for Asians. In this study, the AUC performed best in the total hip diagnostic criterion. Considering the prevalence of OP was only 1.8% according to the total hip criterion, which could not reflect the real prevalence of OP, we set the cutoff value of the worst hip criterion as the optimal threshold. The low-risk thresholds were set at 2% for HF, 3.1% for MOF, 0 for OSTA, and 24.2 for BMI. Test performances at these thresholds are summarized in Table 4. As shown in Table 4, compared to the sensitivity and specificity of MOF and HF, BMI and OSTA performed better. In the worst hip criteria, BMI had the best predictive value yielding an AUC of 0.824, a sensitivity of 83.3%, a specificity of 59.5%, a negative predictive value of 98.6%, and percentage of missed OP of 0.8%. Notes: aPer 100 participants who were candidates for screening and primary prevention. bAs a percentage of participants who had osteoporosis according to BMD testing. Abbreviations: BMD, body mineral density; BMI, body mass index; FRAX, Fracture Risk Assessment Tool; HF, hip fractures; MOF, major osteoporotic fractures; OSTA, Osteoporosis Self-Assessment Tool for Asians. We divided the population into two subgroups based on age (50–65 years and 66–90 years), and the predictive values of three tools in worst hip criteria are listed in Table 5. The results showed significant differences in the prevalence of OP (p<0.05). According to the results, the AUC values of MOF and HF were fairly low, while BMI achieved good predictive value in both the age groups, 0.790 in 50–65 years and 0.829 in 66–90 years. Abbreviations: AUC, area under the receiver operating characteristic curve; BMD, body mineral density; BMI, body mass index; CI, confidence interval; FRAX, Fracture Risk Assessment Tool; HF, hip fractures; +LR, positive likelihood ratio; −LR, negative likelihood ratio; MOF, major osteoporotic fractures; OSTA, Osteoporosis Self-Assessment Tool for Asians. FRAX without BMD is of more limited predictive value for OP in men than in postmenopausal women. According to the results, FRAX without BMD, which had suboptimal sensitivity and an AUC ranging from 0.536 to 0.630, performed worst in all the tools diagnosed by different criteria. Although OSTA and BMI were much simpler, which are involved in only two risk factors, compared to FRAX with >10 risk factors, they performed better than FRAX without BMD in each criterion. These results show that FRAX was primarily developed for predicting 10-year probability of fracture instead of OP and was not an established method for diagnosing OP in men, although it had been reported that FRAX without BMD might be an effective tool in screening for OP.27 Kanis et al28 previously reported that FRAX without BMD might be used to discriminate patients with low BMD, and 10% and 20% probability of a major fracture correspond to −1.5 SD and −2.8 SD, respectively. Therefore, whether FRAX could be used as a screening tool for predicting OP in men was unconfirmed. This study suggested that with a cost of missing 0.1%–3.6% OP patients, BMI and OSTA could reduce 40.0%–42.6% of participants in BMD screening tests. Based on horizontal comparison of various diagnostic criteria, sensitivity, OP missed, and BMD measurement saved for BMI were significantly better when the worst hip was set as the diagnostic criteria. In this criterion there were no statistical differences of the AUC between BMI (0.824) and OSTA (0.804) for predicting OP (p=0.41) and both yielded good assessment ability. The results were consistent with the study purpose that elderly males should receive appropriate treatment (age ≤65 years with BMI <24.7 or age >65 years with BMI <22.5). OSTA was developed to assess multiple clinical risk factors associated with bone loss and OP for postmenopausal Asian women. In many studies, the OSTA was a well-performed tool for predicting OP in postmenopausal women.29 In this study, the sensitivity of OSTA for estimating OP in men was acceptable (83.3%) missing only 0.8% OP participants, and negative prediction (98.6%) was high in the worst hip criteria. The results were similar to the previous study that OSTA index might be an effective tool for primary OP (femoral neck site by DXA) in elderly males. It was worth mentioning that the prevalence rate of OP in men was not related to age, which was different with previous studies about postmenopausal women.11,26,30 Steuart et al designed a study that involved 518 elderly males to evaluate OST in identifying OP and found that an OST index of 6 or lower yielded the AUC of 0.67, a sensitivity of 82.6%, and a specificity of 33.6%, which was similar to this study.31 OSTA was a screening tool for OP associated with age and weight, and this study suggested that age was a clinical risk factor of OP in elderly males according to worst hip criteria, whereas it had a limiting value in the WHO criteria. Thus, further studies on the value of OSTA for identifying OP in the elderly male population remain to be performed. Many studies have shown that BMI is a protective factor in the occurrence and development of OP and have also proved that BMI not only reduces the incidence of OP but also provides reference for prevention and early diagnosis of OP.17,18,32 It is accepted that high BMI can reduce bone reabsorption and stimulate bone formation. In this study, the AUCs of BMI in different criteria (lumbar spine, 0.801; femoral neck, 0.815; total hip, 0.880; worst hip, 0.824, and WHO, 0.808) performed the best. BMI was the optimal tool for estimating OP in all of these tools. In the worst hip criteria, the sensitivity and specificity were 84.8% and 64.4%, respectively. High sensitivity was more significant than specificity to reduce missed diagnosis. It is not necessary that a risk assessment tool has both high sensitivity and high specificity if the tool is free and noninvasive. The primary purpose of a screening tool is to identify most patients at risk, among which BMD can be used to obtain a definite diagnosis. It is generally believed that BMI is a protective factor in men. The increased muscle mass can reduce bone loss and the skeletal muscle loss will lead to a decrease in BMD. Muscle atrophy and muscle dysfunction can promote the loss of bone mass and degradation of bone strength. In some studies, BMD at the lumbar spine and hip sites and BMI are closely related, and BMI >30 kg/m2 delays the incidence of osteopenia by 5 years (at the spine) and 9 years (at the femoral neck).33,34 Results in a recent study of US older adults show a protective, cross-sectional association between BMI and OP, which is consistent with our results.35 However, few studies have focused on the association between elderly male OP and BMI, further investigation should be performed on a larger scale. The strengths of this study include the following: it is a cross-sectional study, not retrospective; the subjects were healthy elderly males; questionnaire data were collected from three different community health service centers; BMD measurements were taken by the same operator and machine; strict inclusion and exclusion criteria to exclude the effects of other factors were imposed; and the results have certain reference value for OP diagnosis, help physicians in primary hospitals or community health service centers to discover OP population and reduce misdiagnosis rate. However, the demographic of the study may be different from the actual demographic profile of Beijing. BMD could only reflect ~70% of bone strength; hence, it is not the best examination method for bone quality in clinic. Causal correlations should not be assessed based upon cross-sectional data, regardless of the sample size and accuracy. Whether the subjects will suffer from fractures years later is unconfirmed, and it needs long-term follow-up. It will be a significant evidence for FRAX in predicting 10-year fracture risk. The validation of three clinical tools in predicting primary OP was compared and found suitable thresholds to omit BMD testing. The results showed that BMI and OSTA performed better than FRAX without BMD, and BMI was the most valuable tool for identifying primary OP in men. To benefit in terms of cost and reduction of unnecessary radiation exposure, we suggest men aged >65 years with BMI <22.5 kg/m2 or <65 years with BMI >24.7 kg/m2 should have a BMD screening test. The study was funded by the Capital Health Project (Z131100006813040), Beijing, People’s Republic of China. Inderjeeth C, Smeath A. Bones beyond 70-insights into osteoporosis management in the elderly. Aust Fam Physician. 2010;39(10):767–772. Drake MT, Murad MH, Mauck KF, et al. Clinical review. Risk factors for low bone mass-related fractures in men: a systematic review and meta-analysis. J Clin Endocrinol Metab. 2012;97(6):1861–1870. Melton LR, Khosla S, Achenbach SJ, O’Connor MK, O’Fallon WM, Riggs BL. Effects of body size and skeletal site on the estimated prevalence of osteoporosis in women and men. Osteoporos Int. 2000;11(11):977–983. Haentjens P, Magaziner J, Colon-Emeric CS, et al. Meta-analysis: excess mortality after hip fracture among older women and men. Ann Intern Med. 2010;152(6):380–390. Kanis JA. Assessment of fracture risk and its application to screening for postmenopausal osteoporosis: synopsis of a WHO report. WHO Study Group. Osteoporos Int. 1994;4(6):368–381. Looker AC, Melton LR, Borrud LG, Shepherd JA. Lumbar spine bone mineral density in US adults: demographic patterns and relationship with femur neck skeletal status. Osteoporos Int. 2012;23(4):1351–1360. Watts NB, Adler RA, Bilezikian JP, et al; Endocrine Society. Osteoporosis in men: an Endocrine Society clinical practice guideline. J Clin Endocrinol Metab. 2012;97(6):1802–1822. Kanis JA, Oden A, Johnell O, et al. The use of clinical risk factors enhances the performance of BMD in the prediction of hip and osteoporotic fractures in men and women. Osteoporos Int. 2007;18(8):1033–1046. Chao AS, Chen FP, Lin YC, Huang TS, Fan CM, Yu YW. Application of the World Health Organization fracture risk assessment tool to predict need for dual-energy X-ray absorptiometry scanning in postmenopausal women. Taiwan J Obstet Gynecol. 2015;54(6):722–725. Kanis JA, McCloskey EV, Harvey NC, Johansson H, Leslie WD. Intervention thresholds and the diagnosis of osteoporosis. J Bone Miner Res. 2015;30(10):1747–1753. Koh LK, Sedrine WB, Torralba TP, et al; Osteoporosis Self-Assessment Tool for Asians (OSTA) Research Group. A simple tool to identify Asian women at increased risk of osteoporosis. Osteoporos Int. 2001;12(8):699–705. Richy F, Gourlay M, Ross PD, et al. Validation and comparative evaluation of the osteoporosis self-assessment tool (OST) in a Caucasian population from Belgium. QJM. 2004;97(1):39–46. Adler RA, Tran MT, Petkov VI. Performance of the osteoporosis self-assessment screening tool for osteoporosis in American men. Mayo Clin Proc. 2003;78(6):723–727. Chen S, Chen Y, Cheng C, Hwang H, Chen C, Lin M. Comparisons of Different Screening Tools for Identifying Fracture/Osteoporosis Risk Among Community-Dwelling Older People. MEDICINE. 2016;95(20):e3415. 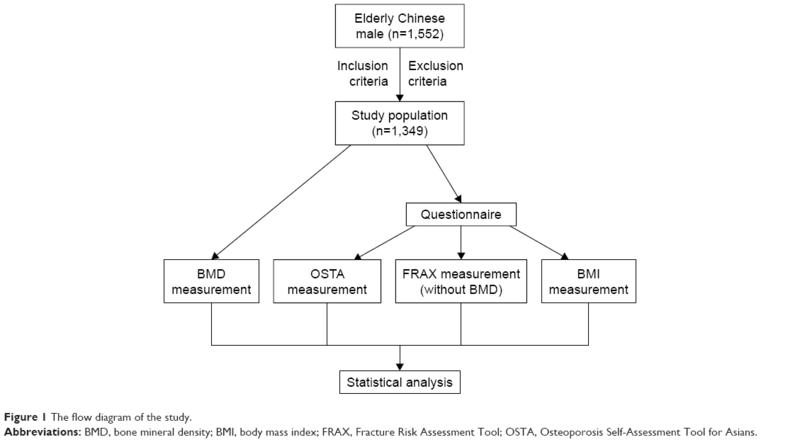 Zha XY, Hu Y, Pang XN, Chang GL, Li L. Diagnostic value of osteoporosis self-assessment tool for Asians (OSTA) and quantitative bone ultrasound (QUS) in detecting high-risk populations for osteoporosis among elderly Chinese men. J Bone Miner Metab. 2015;33(2):230–238. Bergkvist D, Hekmat K, Svensson T, Dahlberg L. Obesity in orthopedic patients. Surg Obes Relat Dis. 2009;5(6):670–672. Saarelainen J, Kiviniemi V, Kroger H, et al. Body mass index and bone loss among postmenopausal women: the 10-year follow-up of the OSTPRE cohort. J Bone Miner Metab. 2012;30(2):208–216. Kanis JA, Johnell O, Oden A, Johansson H, McCloskey E. FRAX and the assessment of fracture probability in men and women from the UK. Osteoporos Int. 2008;19(4):385–397. Li N, Ou P, Zhu H, Yang D, Zheng P. Prevalence rate of osteoporosis in the mid – aged and elderly in selected parts of China. Chin Med J (Engl). 2002;115(5):773–775. Si L, Winzenberg TM, Jiang Q, Chen M, Palmer AJ. Projection of osteoporosis-related fractures and costs in China: 2010–2050. Osteoporos Int. 2015;26(7):1929–1937. Looker AC, Melton LR, Harris TB, Borrud LG, Shepherd JA. Prevalence and trends in low femur bone density among older US adults: NHANES 2005–2006 compared with NHANES III. J Bone Miner Res. 2010;25(1):64–71. Johnell O, Kanis JA, Oden A, et al. Predictive value of BMD for hip and other fractures. J Bone Miner Res. 2005;20(7):1185–1194. Kanis JA, McCloskey EV, Johansson H, Oden A, Melton LR, Khaltaev N. A reference standard for the description of osteoporosis. Bone. 2008;42(3):467–475. Looker AC, Borrud LG, Dawson-Hughes B, Shepherd JA, Wright NC. 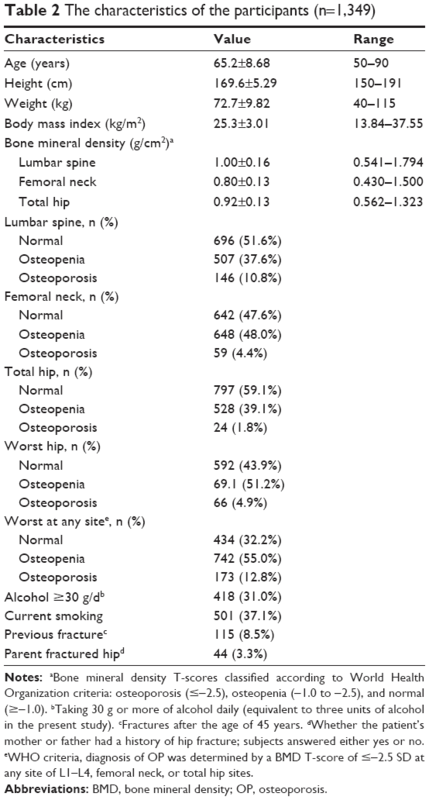 Osteoporosis or low bone mass at the femur neck or lumbar spine in older adults: United States, 2005–2008. NCHS Data Brief. 2012;(93):1–8. Compston J, Bowring C, Cooper A, et al. Diagnosis and management of osteoporosis in postmenopausal women and older men in the UK: National Osteoporosis Guideline Group (NOGG) update 2013. Maturitas. 2013;75(4):392–396. Kanis JA, Harvey NC, Johansson H, Oden A, Leslie WD, McCloskey EV. FRAX and fracture prediction without bone mineral density. Climacteric. 2015;18(suppl 2):2–9. Rud B, Hilden J, Hyldstrup L, Hrobjartsson A. Performance of the osteoporosis self-assessment tool in ruling out low bone mineral density in postmenopausal women: a systematic review. Osteoporos Int. 2007;18(9):1177–1187. Ma Z, Yang Y, Lin J, et al. BFH-OST, a new predictive screening tool for identifying osteoporosis in postmenopausal Han Chinese women. Clin Interv Aging. 2016;11:1051–1059. Steuart RJ, Lazzari AA, Teves QD, Desale S, Howard R, Kerr GS. Validation of the osteoporosis self-assessment tool in US male veterans. J Clin Densitom. 2014;17(1):32–37. Lin J, Ma Z, Fei Q, et al. [Association of body mass index and male primary osteoporosis]. Zhonghua Yi Xue Za Zhi. 2014;94(33):2593–2596. Chinese. Soltani A, Larijani B, Khashayar P, Rezaei HM, Fakhari S. The relationship between anthropometric parameters and bone mineral density in an Iranian referral population. Acta Med Iran. 2014;52(7):505–510. Sadatsafavi M, Moayyeri A, Wang L, Leslie WD; Manitoba Bone Density Program. Heteroscedastic regression analysis of factors affecting BMD monitoring. J Bone Miner Res. 2008;23(11):1842–1849. Lloyd JT, Alley DE, Hawkes WG, Hochberg MC, Waldstein SR, Orwig DL. Body mass index is positively associated with bone mineral density in US older adults. Arch Osteoporos. 2014;9:175.